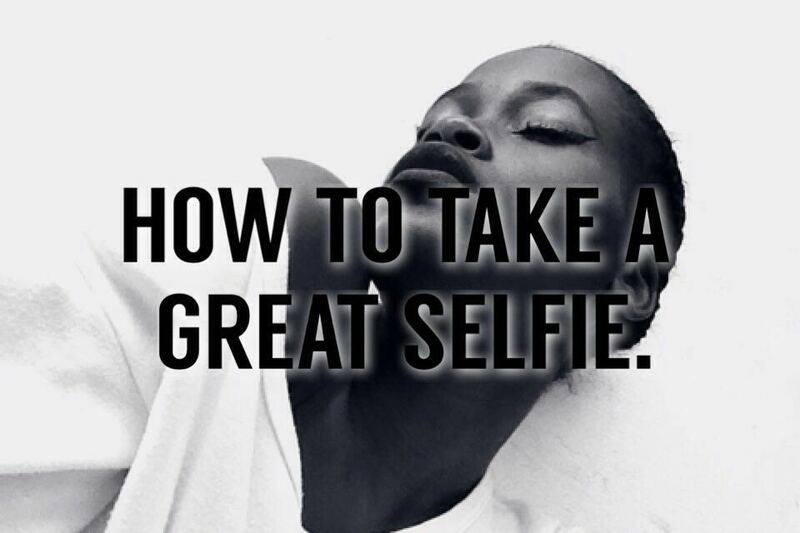 HOW TO TAKE A GOOD SELFIE. Hey guys what is up? Long time no talk, I know , I know, no need for the tears. Does anyone else notice the split personalities I have? Anyway today for you guys I’m gonna teach you how to take a good selfie. No, I’m not saying I’m the master of selfies or anything like that but many people often come to me asking how I take my pictures so I figured why not write about it on my blog? ● Decide on the type of picture you want and Get yourself in the mood. The first thing that you have to do in taking a great picture is getting yourself in the mood and in the picture. Don’t attempt to take a picture while you’re feeling sad or disorientated. If it’s a badass picture you’re looking for then go search for some badass people and just get ideas on how you want your pictures to look. You can also listen to some badass music that talks about guns to get you feeling like Angelina Jolie in SALT. ● Hair and make up. Girl no one wants to see your cracked lips and your wild hair, fix yourself up! Depending on the type of picture you want, do your makeup according to that. If you don’t like makeup then fix your hair into something that goes with the type of look you’re looking for. Whether you fix your hair into a bob or into something tweased it’s up to you. I know I sound weird but a good picture should tell a story. For this you can use your facial expressions, body language and even your clothing and or makeup. For example a sharp winged liner and a glare would say don’t touch me while a plain face and a smile could say I’m friendly. So depending on the type of picture you want, tell a story or give out a message with it. No I’m not going to tell you to go buy some good lighting or something like that but make sure that your pictures are clear and that we can see you. So stand outside your window or somewhere with good lighting and take your picture. Make sure that sun is not directly facing you cause not only will that hurt our eyes but you’ll also look like a globe. So depending on where you live make a routine with the sun, knowing at what time the sun shines nicely but not too harshly or find a spot where you look good. I feel like the background is the most important part of a picture. No, we don’t wanna see your room littered with clothing all over. Find a nice simple, clean background and take your picture. On most of my pictures I use a white background because then I know it won’t clash with what I’m wearing and I can easily edit it. So if you have a white background wall or then make use of it. Your pictures will definitely stand out more and look more cleaner. Otherwise just gind a nice wall and take your picture. If it’s inside you’re taking a picture make sure that the place is clean. Just move around everything and make it neater. Yuup guys those are all my tips for taking a great selfie or just a picture in general. By no means do I think I’m an expert in taking pictures or that I know a lot about taking pictures. These are general tips I use and I feel like without them I wouldn’t take any good pictures. I hope that my tips helped you and that you learnt a thing or two about taking pictures and how you could improve yours. I’m sorry I’m not posting that much anymore just having a whole lot of school work and by the time I have to write something I don’t even feel like it because I’m so tired from school and sports so yeah. Do you wanna see how I edit my instagram pictures or all my pictures in general? If this post gets 15 likes then I’ll post it nect week. Or you can just leave a comment below! ← MR PRICE MINI HAUL.